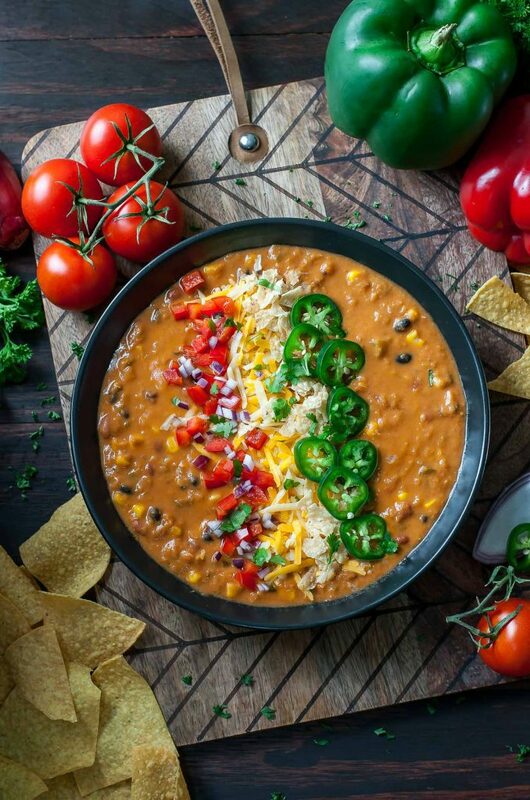 This uber easy and crazy flavorful Vegetarian Lentil Tortilla Soup can be made in a pressure cooker, slow cooker, or on the stove, making it one of our favorite make-ahead soup recipes! crushed tortilla chips - my favorite! Below are the electric pressure cooker and slow cooker instructions, see blog post below for directions to make this bad boy on the stove. First, chop your veggies and measure out the ingredients. Next add everything but the heavy cream your toppings. This includes bell pepper, jalapeño, corn, lentils, black beans, pinto beans, broth, tomato sauce, tomato paste, salsa verde, and all your herbs + spices. Toss them in and set IP to high pressure for 15 minutes. Walk away; FREEDOM! Stir in the cream, add all your favorite toppings, and enjoy! First chop your veggies and measure out the ingredients. This will make everything super easy to toss together! Next add everything except the heavy cream and toppings. Cook on high for 4-6 hours or low for 7-8 hours, until dried lentils are cooked through and veggies are tender. My soup was perfect after 5 hours on high. Swirl in the cream, add all your favorite toppings, and dive in! 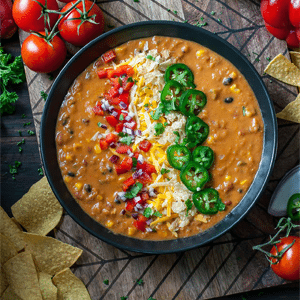 For a thicker soup, feel free to add some corn tortillas (torn into pieces) to the soup or simply swirl crushed tortilla chips into the soup after serving! In place of the heavy cream, feel free to use half-and-half or cream cheese. Skipping the cream? No problem! This recipe can be made without it – let your tastebuds be your guide. Feel free to adjust the consistency of the soup to your liking. The soup can be thinned with a little broth or tomato sauce if desired or thickened with extra cream or beans/veggies! If you add a lot of extra liquid, consider amping up the spices a smidge to compensate. You can also make this as mild or as spicy as you’d like. As written it’s on the medium side. The type of salsa used, jalapeños, and cayenne pepper will control the heat factor. Want it super chunky? Feel free to add extra beans and veggies! Simply amp up the seasoning as needed depending on how much extra goodies you add to the pot. A NOTE ON SALT AND PEPPER :: I leave salting the dish to the end to prevent over-seasoning. Depending on the brand and type of broth, tomatoes, and beans that you use, the sodium content will vary. I usually don’t add any salt until the end once I am able to taste the soup. Pressure cooker recipes always leave out the details so here’s a breakdown of what you can expect time-wise: About 13 minutes to come to pressure plus 15 minutes cook time and 15 or so to release pressure. You won’t need to be anywhere near your kitchen for this all to partake, the Instant Pot will handle it all and switch to warm once it’s done. So fabulous right? For the slow cooker, simply set a timer and you’re good to go. Nutrition facts below calculated before optional cream + toppings.